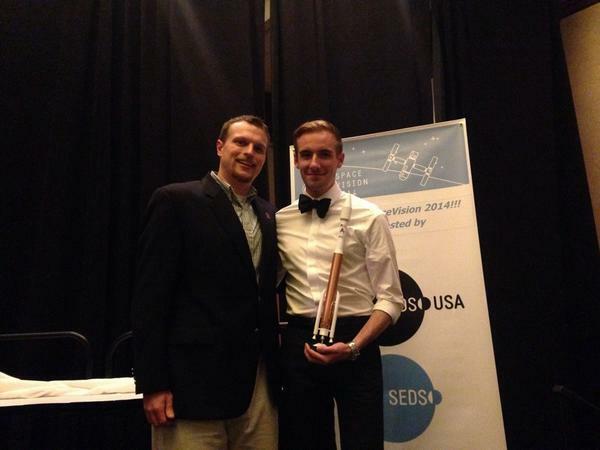 November 5, 2014 – The University of Colorado Boulder won the 2014 University Student Rocketry Challenge. The announcement came at the SEDS SpaceVision 2014 conference held in Durham, North Carolina from October 30-November 2. This year’s USRC competition challenged teams to design and launch a high-powered rocket to an altitude of 10,000 feet while carrying a standardized payload. Teams earned additional points for including a custom payload or propulsion system. The USRC is designed so that it can be successfully completed by teams with very little experience in high-powered rocketry, but will also pose a challenge to teams who have experience. Teams gain invaluable real-world training as they’re scored on design, engineering, and manufacturing processes in addition to the flight of the rocket. A panel of aerospace industry professionals serve as judges. SpaceVision is the annual national conference of Students for the Exploration and Development of Space. The conference is run and organized entirely by students and encourages student leadership in aerospace and STEM fields.